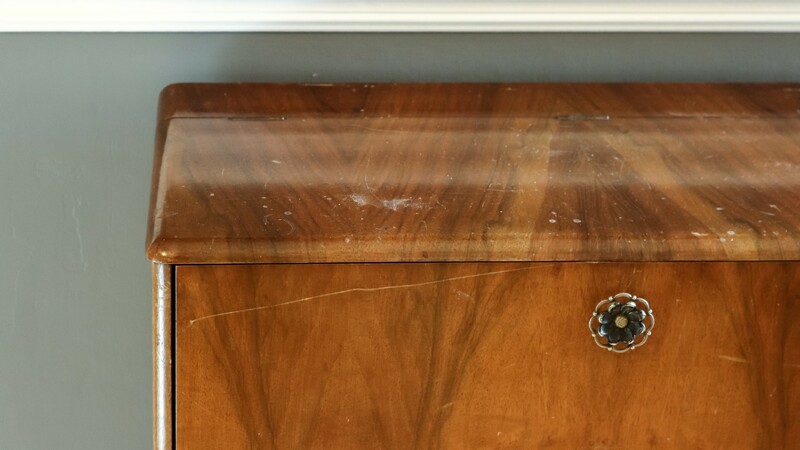 In this video I restore the finish and repair some broken and chipped out veneer on a vintage cocktail cabinet which has a hinged top section, mirrors and a light. 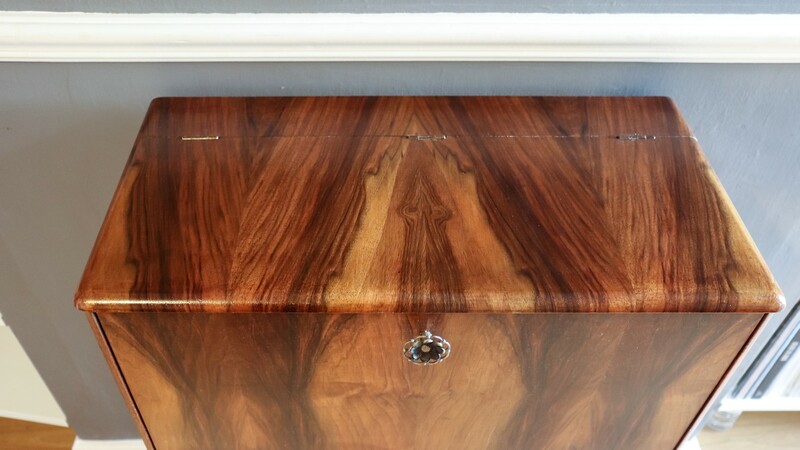 In this video I'm going to be restoring a cocktail cabinet for a client who dropped this off at my house shortly after picking it up from a local furniture shop. Structurally it in was in good condition, nice and solid, but there were lots of scratches, and also some chipped out veneer, the worst area being this one at the bottom back corner and I'll repair that later in this video. The finish also looked a bit dull and lifeless. The top section hinges open and has mirrors on the inside and a light that didn't work - we'll have another look at the light fixture later in this video. 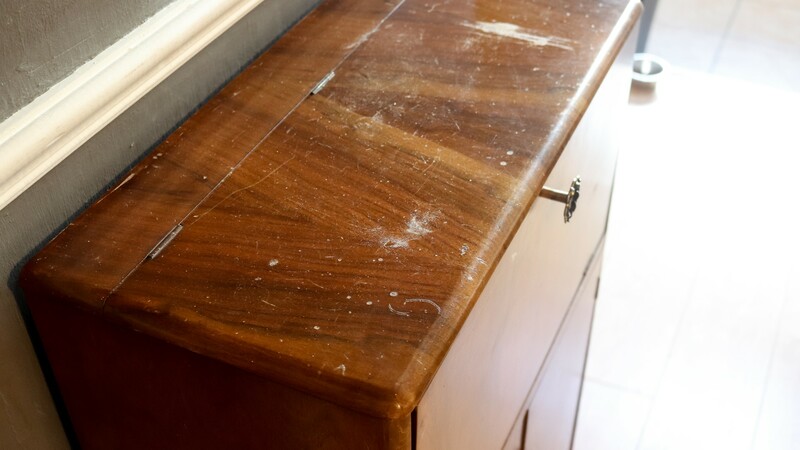 And the bottom section is a cabinet with a key lock, one shelf and many cobwebs. 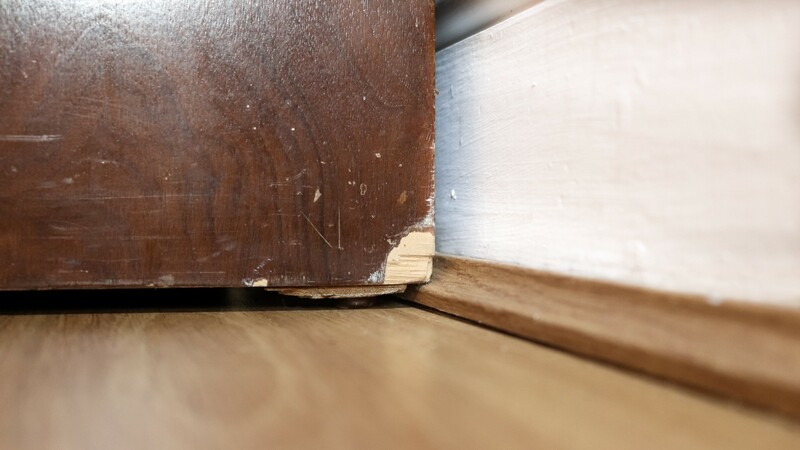 I lifted the unit on to some sawhorses so that I could have a look underneath as often with furniture like this you'll find some woodworm damage, but not this time, no signs of woodworm past or present, so no need to apply any treatment. I'm going to be using my card scraper to remove the old finish, so I began by preparing a burr on to the edges. If you're interested in finding out more about that, I have a video which goes in to detail and I'll leave a link to that in the description box. I started on the top panel to see how well the card scraper worked to remove the old finish working in the direction of the wood grain to minimise any chance of damaging the veneer. The card scraper works really well for this, you can see by the dust here that it's only removing the finish and none of the wood, which is just what I wanted. Then it started to rain, which was a shame as I was hoping to do this outside because of the amount of dust that this stirrs up in the air, but no such luck so I moved it inside the workshop and carried on working. For the back section of the top, there wasn't really enough room to get in there with the card scraper so I used by carbide scraper instead, and that worked well too. Sanding worked well to remove the finish on the curved edge although 100 grit is quite coarse, so later when I do the final sanding I'll sand at 240 grit to smooth things over. I like to apply this, wait for it to dry, and then re-apply to get the desired colour. Next I worked on scraping the sides. I'll work on repairing those parts later in the video, first I wanted to get all of the scraping out of the way. Here you can see just how useful this carbide scraper is for getting in tight right up to the edges. 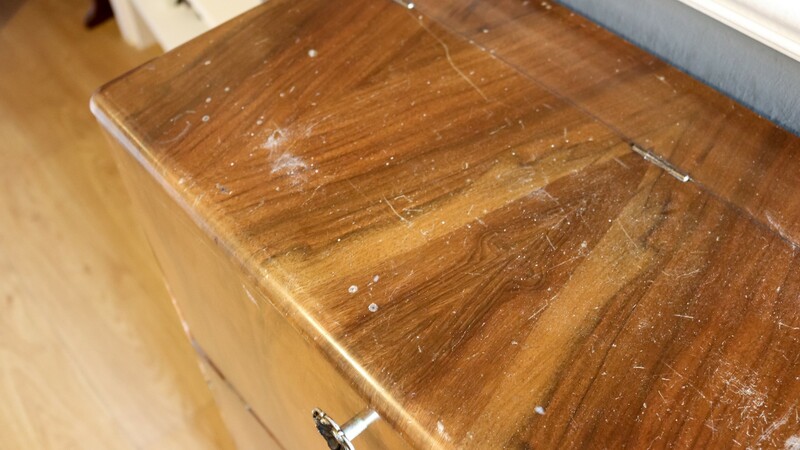 Here I'm rubbing with white spirit again, I was really pleased with how the veneer looked again. Next I could start working on the front and I decided to remove the handles and lock to make things easier. Here's another one of the deep scratches, and once again it came out no problem. 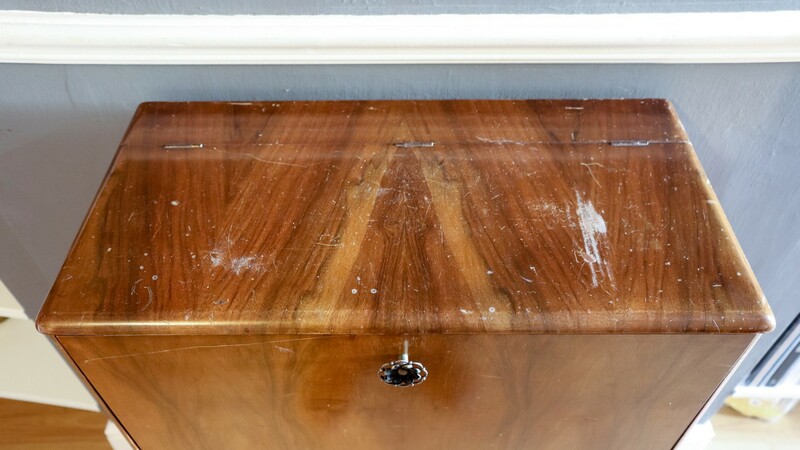 I mixed up some walnut stain with some white spirit just to dilute it down a little because I didn't want it to be too dark - it's much better to have it too light, because that way you can re-coat it. After two coats I was happy with the colour so I left it there. Once all the scraping was done I sanded everything at 240 grit. I sanded by hand because I didn't want to risk sanding through the veneer which is pretty easy to do with a random orbit sander. Don't ask me how I know. Next I started working on the veneer damage. For this piece at the back I just lifted it up using a knife blade, got some super glue in there, wiped away the excess with white spirit and then taped it down. I also clamped on a scrap board. Once that was dry I did a bit of sanding and I'd work some more on this area later on. I applied some boiled linseed oil to the entire unit to pop the grain. I just wiped it on with a cotton cloth, I'm using a piece of old bed sheet here. Next I started working on the damage to the corner of the side panel at the bottom, first I made a few cuts with a sharp knife and a ruler to guide it to keep it nice and straight. I could then peel away the veneer ready for the new patch to be applied. Using another piece of the same veneer, I added some boiled linseed oil just to see how good a match it would be and it looked pretty good. I made a few cuts with a knife to get it down roughly to size but keeping it a little bit bigger than needed. At first it didn't marry up to the straight edge very well so I used a chisel to refine the shape and then it looked good. 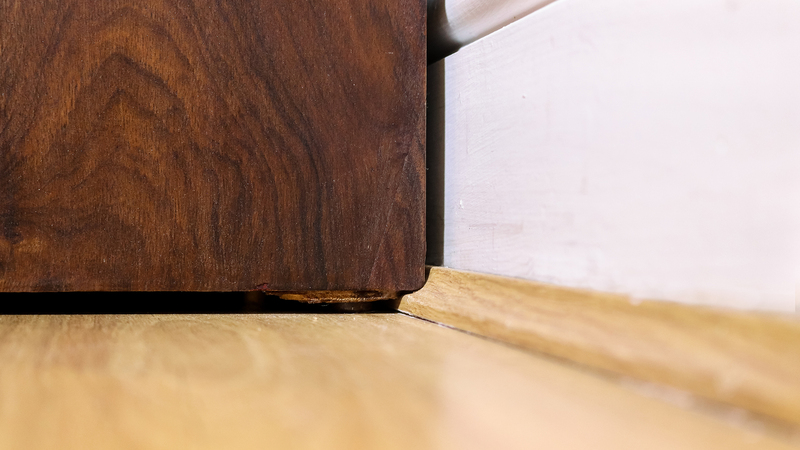 I taped the new veneer in place which formed a hinge so that I could lift it up to apply the glue and I decided to use epoxy for this because it's a good gap filling glue, and the surface I'm applying it to isn't perfectly flat because some of the wood had been chipped away. After mixing it up I waited a minute or two just for the epoxy to start to thicken a bit so that it was less runny, and then I applied it. I clamped a board down to that too. I gave it about 7 or 8 minutes and then came back and removed the tape and clean away the excess glue. Next I could trim away the excess with a knife. And then I did some sanding to fush everything up, first with 100 grit and then 240. I then applied boiled linseed oil but the veneer patch looked quite light in colour, so I came back with the same stain that I'd mixed earlier, and applied that to the new patch and that matched the colour really nicely. For the other part of damage at the back that I used super glue on earlier, I just touched that up with the brown Sharpie pen again, to help it blend in. I decided it was too small an area to warrant patching in some new veneer, and same applies to the small chips at the bottom. 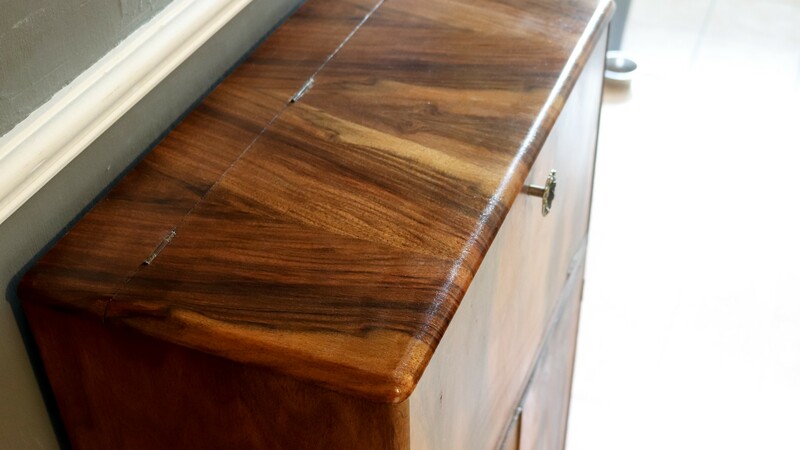 I left the unit alone for a couple of days so that the oil finish had time to fully cure and then I could apply the top coat of finish, and for that I chose water based varnish as it's hardwearing so it will protect the cabinet from things like moisture and heat marks. I gave it three coats, denibbing with 400 grit in between each coat. 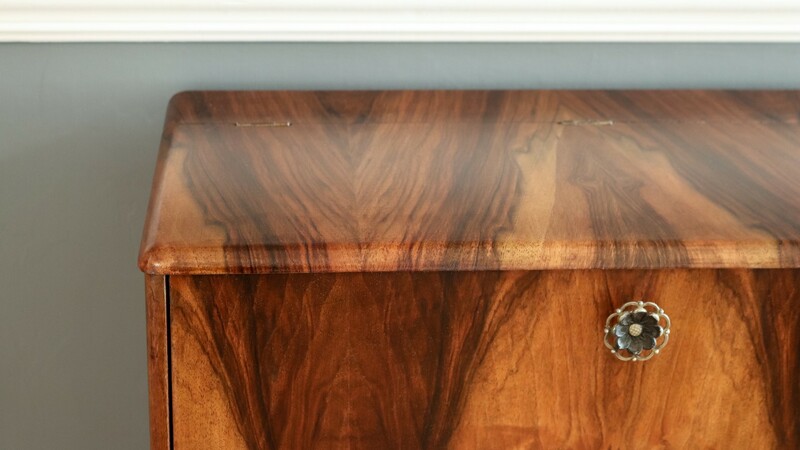 The varnish gave the cabinet a nice satin sheen, and de-nibbing made the finish super smooth. I could then add the handles, lock and key plate. 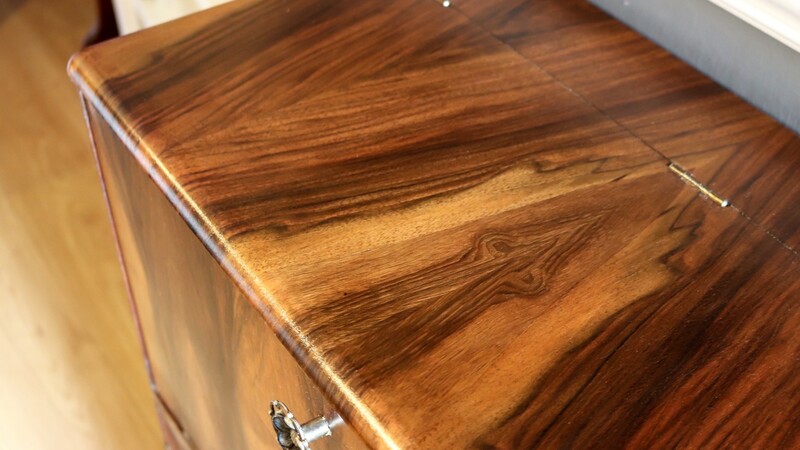 The wood grain on the cabinet looked so similar to the walnut veneer which I had applied to a coffee table in another recent project video, and that makes me think that the veneer used on this cabinet is walnut too. 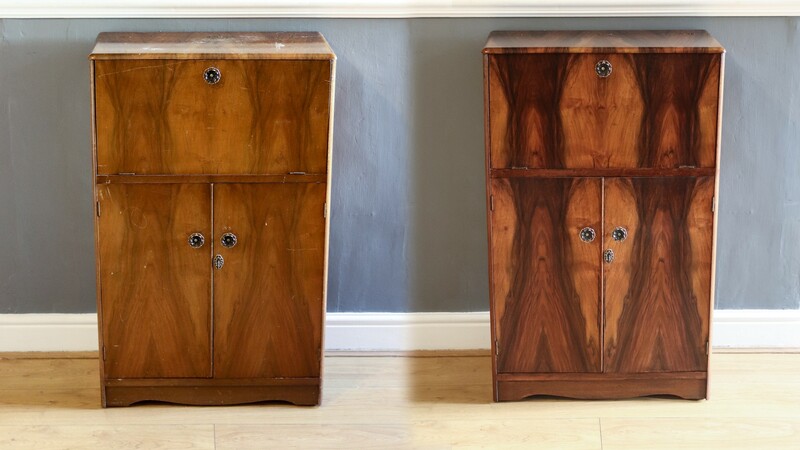 These two pieces of furniture would look great in the same room together, it's almost like they were separated at birth. A lot of the dust from all the scraping and sanding had made it's way in to the inside so I used the vacuum to clean it out and then used some glass cleaner to polish up the mirrors. I also cleaned up the juice squeezer and cocktail sticks. So I mentioned near the start of this video about the broken light fixture in the cabinet. There was no cable and no bulb. Once I had finished the restoration side of things I spoke to my friend Alex to see if he could get it working, you might recognise him from a few of my older videos. Anyway, he said yes, so he popped round with some new cable and one of these S15S bulbs, and a plug for the cable too which he wired up. We had to drill out the hole a little wider in order to be able to fit the new cable through the back of the unit and the hole was really close to the top so I took it really slowly to avoid damaging it. We left about 2m of cable at the back, and then Alex wired it up to the light fitting and the switch which automatically turns the light on and off.